The Kalamazoo Wiffle League is the No. 1 competitive wiffle league in the nation, one of its players tells me. This becomes apparent when you see Steve Everett's leaping catch below, and even more so when you see the lengths the wifflers went to verify the call. At stake were the tying runs in the last inning, after all. 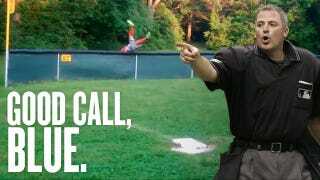 So they phoned an MLB umpire. Who wouldn't? The scene: On Monday, the league's two best teams—the 10-1 Industrials and the 10-2 Friars—met for a doubleheader at Oshtemo Township Park. The Industrials took the first game, 1-0, but our dramatic scene takes place in the second game, top of the sixth and final inning, two out, men on first and second for the Friars, who are down 6-3, with Kevin Marszalek up. This is why it pays to have 6-foot-6 left fielders like Steve Everett, who made the catch here. When the left field foul pole is 82 feet away, you want height. However marvelous the catch, there had to be a morning after. Or at least a beat after. Everett caught the ball and then carried it into home run territory. The Friars thought it was a home run; the Industrials thought it was an out. Ryan Winfield, another player, joked that the group should phone Tim Welke, an MLB umpire since 1984 and a Kalamazoo native. Actually, Everett said, I think I have Bill Welke's card. Bill—Tim's brother—has umpired in MLB since 1999, and his son is an athlete at Marshall High School, where Everett works as an athletic trainer. (The school is about an hour outside of Kalamazoo.) When else could an umpire's card come in handy? Luckily, the card had his cell phone number. I then called Bill Welke not knowing what to expect. He answered, "Bill Welke." Steve Everett - "Bill Welke. Hi, this is Steve Everett, the Athletic Trainer at Marshall High School"
Bill Welke - "Hi Steve, how's it going?" S.E. - "Good. I have a baseball related question for you." After Everett explained the situation, Welke delivered his ruling: "If a fielder catches a ball, then goes out of bounds it is then ruled a catch (out), and if there are runners on base, the runners move up one base. Right guys?" The other umpires—on that day, Tim Tschida, Jeff Nelson, Mike Estabrook, and an unknown replacement—agree with Bill. And, for the record, so does Rule 7.04(c). The two runners advanced their base harmlessly—on paper, that is—while the Industrials won the game and swept the doubleheader, strengthening their hold on the league's best record. Later that night, the Rockies and the Padres played a game. Bill Welke was third-base umpire. There were no controversial plays, no tying runs up in the ninth, no circus catches. The biggest call Welke made all day was for 12 dudes in a wiffleball park halfway across the country.